SW Charter School Volunteer of the Year ~ Melissa Allen! A couple of years ago, we started a tradition of giving out a Volunteer of the Year Award on auction night to recognize all the time and energy given by a special volunteer that has gone above and beyond. This year, we had many nominees, all of whom were deserving for all that they have given, but one person stood out in the voting, and that is parent and volunteer, Melissa Allen. Melissa has helped out in Mike’s classroom for the past 2 years, including creating a weekly art curriculum and projects for his class. Melissa has co-chaired the Staff Appreciation Committee, where she recognizes staff birthdays & life events each month, coordinates potlucks for staff on long conference days, and plans our Staff Appreciation Week with a special tribute to staff each day of that week. Did you know we have a Girl Scout Troop here at SWCS? Melissa leads our girls in that too! 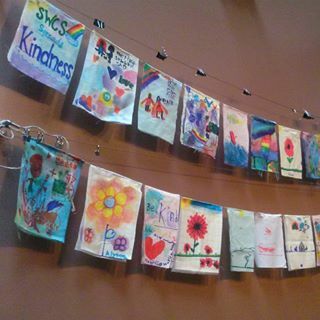 Also, for our past two auctions, all the decorations were designed and put together by Melissa! There are also a whole long list of all the things that she does, that might go unnoticed by some, but stand out in the hearts of those people she crosses paths with. She is also one of the kindest people. Melissa always has a smile on her face and a creative idea to share (she has made those Kindness Week projects happen too!). Thank you Melissa, for all that you have done, and continue to do. You make SWCS a much better place, and we’re so glad you’re here. 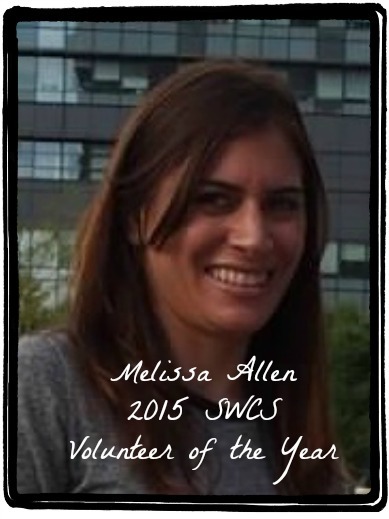 This entry was posted in Volunteer and tagged melissa allen, volunteer of the year. Bookmark the permalink.